After completing a four-year degree, graduate school is the next step to take toward advancing in one’s career. For those who work within the psychology field, a graduate degree is often a prerequisite for obtaining certification as a licensed counselor. In grad school, you will continue to learn how to practice advanced counseling techniques through hands-on experiences while furthering your knowledge through research. Whether you attend graduate school straight out of college or are returning after several years of working in the field, here is what you should expect regarding the debt you might incur during our education in graduate school. Depending upon your state and local laws, becoming a counselor may require you to complete an advanced degree. For individual and family counselors, a master’s degree may be required before you can apply for licensing. However, those who desire to become a practicing psychologist may need to obtain their doctorate. In addition to becoming eligible for licensing and certification, earning a graduate degree will enable you to establish yourself as a professional while enhancing your ability to help your patients. Although it is normal to be concerned about the debt that will be incurred during graduate school, it is important to remember that it will pay off in more rewarding career opportunities. 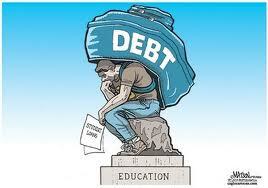 According to the Wall Street Journal, the average debt for graduate students is $43,524. It is also important to note that several factors weigh into this number. For example, the school you choose, the debt you hold from prior educational experiences and your living situation will all play a role in the amount of debt you incur before graduation. Fortunately, there are many financial options that can be taken advantage of to reduce your potential debt load. First, you will want to select a school that offers advanced degrees in counseling at tuition rates that are affordable. Second, you may wish to look into any opportunities for scholarships and grants that are offered by your school, employer or professional organizations. Finally, check into government loan programs that can offer lower interest rates than private lenders. According to the U.S. Department of Education, the Federal Perkins Loan and the William D. Ford Federal Direct Loan Program are two options for financial aid that you might consider. Even if you must accrue debt during your time in graduate school, there are several ways you can manage it so that it does not become overwhelming. Consider working while you are still attending school so that you can pay off some of your expenses while earning your degree. Additionally, be careful to only apply for enough money to cover your educational expenses. If you find that you have more than enough, apply that money back to your loan amount. After graduation, be sure to begin paying on your loan immediately to reduce the amount of time it will take you to pay it back to your lender. Attending graduate school is the right choice for those who desire to advance in their counseling career. Through advanced education, you will hone your skills so that you will be able to effectively treat your patients. Although debt might be a serious concern, the amount of debt you incur can be reduced and managed with some strategic financial planning that includes seeking assistance through programs offered by your school, employer and the government.